We visited Susanna MacManus, co-owner of Cielito Lindo, and granddaughter of Aurora Guerrero, the founder and inventor of the taquito. 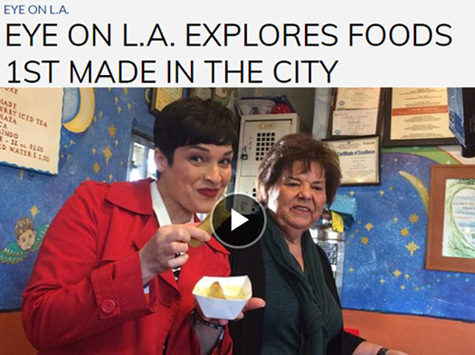 Located on Olvera Street in Los Angeles, Guerrero's daughter used her taquito recipe to open a chain of restaurants in Los Angeles. This family owned business has been carried on by each new generation of Guerrero women. The taquitos, shredded beef rolled in a corn tortilla and fried are made fresh to order, then served drenched in a secret family recipe avocado sauce. East L.A.'s Cielito Lindo single-handedly set off America’s taco craze when they opened their stall in 1934 and started serving beef taquitos in avocado sauce. "Follow the smell of taquitos muy auténticos at this LA institution on historic Olvera Street. The tiny stand has been serving freshly stuffed, rolled and fried taquitos since 1934, enough to earn its street cred title of "world famous. The thing to order is obviously taquitos, though there are also burritos and chile relleno, which come smothered in guacamole sauce and optional beans and cheese." "It was a banner year for Los Angeles cookbooks. The idea for L.A. Mexicano, which in some ways is a culmination of the type of coverage Esparza has been doing for years, came from Prospect Park Books editor Colleen Dunn Bates, who had long wanted to publish a cookbook detailing the dynamic foodways of Mexican cooking in Los Angeles. Filled with 40 profiles of chefs, bakers, restaurateurs, street vendors, and other culinary artisans, the book offers insight that spans generations. Many names you might recognizeRay Garcia, Rocio Camacho, Carlos Salgadobut even more fascinating are interviews (and recipes) from the families behind such civic institutions as Cielito Lindo on Olvera Street (open since 1934), El Tepeyac Café, and Casa Vega.."
Since the 1930s, this tiny stand  located in the heart of historic L.A.  has been famous for its rolled, fried taquitos, covered in avocado sauce. Arellano thinks of the food stand as a Plymouth Rock of tacos, one place where the Mexican staple met a broader American audience. "1934 marked the year that Cielito Lindo first landed in Los Angeles, doing rolled tacos that were all the rage. The tradition continues today, as the restaurant helps anchor the bustling Olvera Street in Downtown's northern edge." "Taquitos have such an interesting history...one connected to Olvera Street, where the restaurant was founded. The original owner of Cielito Lindo was Aurora Guerrero, a single mother of five children who was able to start her business with the help of a woman named Christine Sterling. Mrs. Sterling's only requirement was that Aurora had to create something "different" to sell and that's when the taquito was born! When you go to Cielito Lindo, be sure to try the original recipe with the guacamole sauce - unbelievably delicious!." "Absolutely the best tasting taquitos in the land!! My family has been going to Cielito Lindo since early 1940's although this little taco stand started in 1934 on the corner in Olvera Street. My mom's family went here, my mom when she was a kid, my family and now my kids and grandkids go and we make it an event. Since we have lived in LA all our lives it has been easy to come here and we buy the taquitos by the dozens." "In a little shack located at the end of Olvera street just a few blocks away from Union Station in downtown Los Angeles one can find some of the crispiest, most sumptuous Taquitos around. Located in a ramshackle structure at the end of a vibrant and bustling street market, the Cielito Lindo has been feeding Los Angelinos since 1938. Despite offering only a limited menu of taquitos, tamales, chile rellenos, and burritos and being surrounded by numerous other Mexican restaurants, there are always people waiting in line." "The Cielito Lindo taquito itself is almost chewy. The meat is sinewy and subtly seasoned. The sauce is tangy, and so thin that it's hard to believe it came from an avocado. It coats the slender golden-brown taquitos like hot green candle wax on a supermodel's fingers. You can't eat just two; I prefer them the way Mar-kes used to dish 'em up: by the half-dozen." In Los Angeles, Cheech Marin needs no introduction. He's a local. "I was raised in downtown L.A.," he says. Of course, the actor-comedian is also a familiar face to millions after appearing in countless films and television shows such as "Nash Bridges," and he first came to fame for making America laugh in a series of Cheech and Chong recordings and films that were major successes in the 1970s through early 1980s. 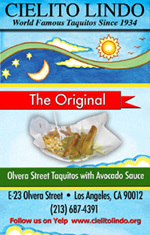 Olvera Street's 3 Greenest Taquitos: Just how different can taquitos really be? Turns out there's a lot more going on with these Mexican delicacies than their "tiny taco" name would suggest. 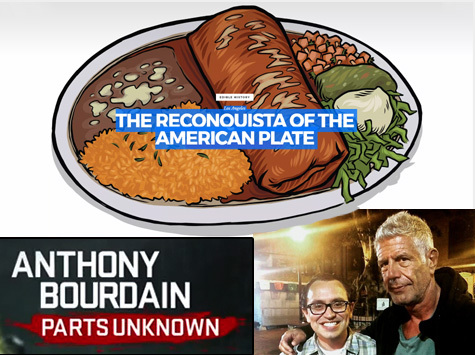 So how do three Olvera Street favorites stack up.